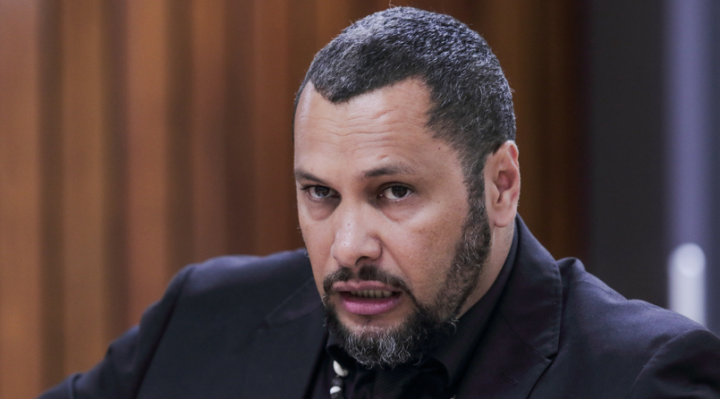 Port Moresby – Governor of Oro Province, Papua New Guinea (PNG) Gary Juffa said that the spearhead organization of the Melanesian group or often called the Melanesia Spearhead Group (MSG) could be of no use. The Melanesian Spearhead Group is absolutely pointless if PNG and FIJI..the largest economies continue to turn a blind eye to the injustice by Indonesia and the world brutally dished out to West Papua and its people.. According to him, if PNG and Fiji continue to turn a blind eye to the injustices committed by Indonesia towards Papuans in West Papua, then MSG is of no use. 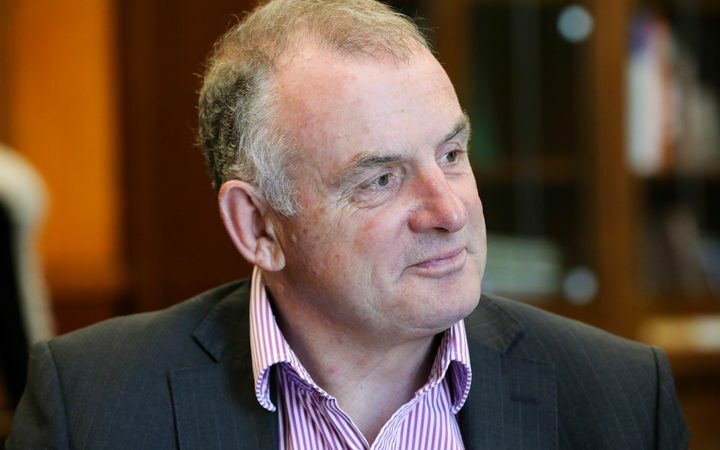 Nine New Zealand politicians are preparing for a six day trip to Solomon Islands and Vanuatu next week. Speaker Trevor Mallard, along with five women and three male MPs, will meet with parliamentarians, NGOs, businesses and women’s groups in both countries. The visit will focus on New Zealand’s development programme, building relationships with parliamentary colleagues, and exploring trade and investment ties. Mr Mallard said the women MPs will have discussions with local women leaders about the contributions they can make in Parliament. Mr Mallard said the Pacific region is incredibly important to New Zealand and the travelling MPs have a wealth of parliamentary knowledge and experience to share. He said he also expects the programme will help identify mutually beneficial business opportunities in the Pacific. Samoa will take the position of Pacific Island Forum members and support “constructive engagement” with Indonesia on issues relating to West Papua. Earlier this week, the Bishops of the Anglican Church in Aotearoa, New Zealand and Polynesia called for Samoa to increase vocalisations of concerns against the reported actions of Indonesian military against West Papuans. In a public statement, they expressed “deep disappointment” at what they described as the continued suppression of the first people of West Papua. The Bishops said they are praying that the Indonesian authorities halt human rights abuses, and proposed a four-fold course of action for the governments within the Anglican Church’s jurisdiction—New Zealand, Fiji, Tonga Samoa, American Samoa and the Cook Islands—to take. Despite the call, Prime Minister Tuilaepa Dr Sa’ilele Malielegaoi said he agrees with the consensus of the Forum, which can press the Indonesian government on moral issues. In September, the Forum supported “constructive engagement” over human rights, and members of the Forum were asked to support a resolution to go before the United Nations General Assembly. “On the moral issue, we hold the common stance of the Pacific Island countries. “The Indonesians should deal with the issue appropriately of human rights abuses,” he said. The Prime Minister continued that the government and the army of Indonesia may be acting independently of each other, and that should be taken into consideration. On the issue of West Papuan desire for self-determination, Prime Minister Tuilaepa said he does not feel he has the power to interfere. “This is part of Indonesia. However, he did say the United Nations are the only authority that can help West Papua gain independence, just as Samoa did in 1962. 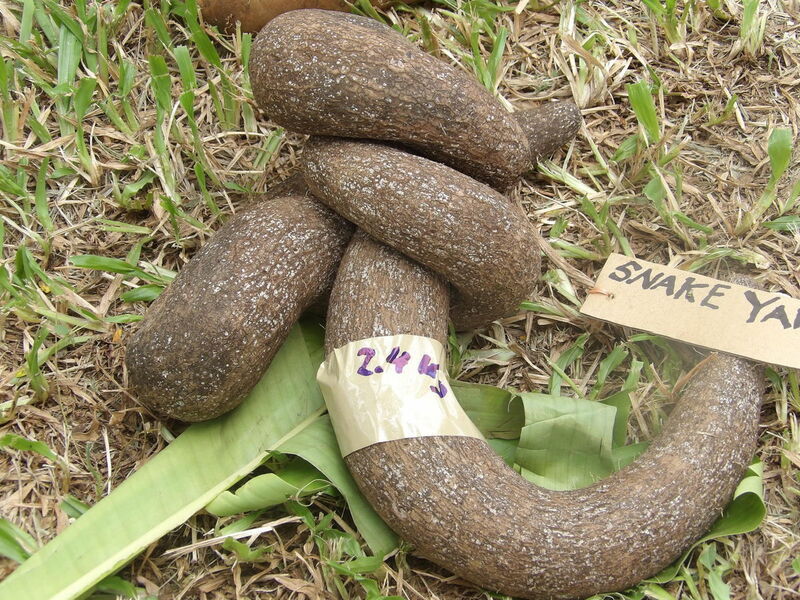 “That is the road we travelled in order to become independent,” Tuilaepa said. A motion moved in Parliament yesterday by Prime Minister Charlot Salwai and seconded by Deputy Prime Minister, Bob Loughman, was passed after it was unanimously supported by both sides of the House. The motion sought to amend the Standing Order 14 of Parliament on how Parliament can be requested by the majority of members to sit in an extraordinary session. As a result of the motion, a new Standing Order 14(1)(A) was inserted. The new Standing Order 14(1)(A) reads: “A request made by the majority of members of Parliament under this Article must be signed by the majority of members at the same time in the office of the Speaker in the presence of the Speaker or the Clerk”. Initially the Deputy Leader of the Opposition reportedly announced that the Opposition would abstain, but after the Government agreed to change the “and” to “or” in the phrase “in the presence of the Speaker or the Clerk”, both sides supported it. The change with the unanimous support of Parliament means that a request by majority members of Parliament will no longer be signed at secret locations or nakamals as the signing will have to be made in the presence of the Speaker or the Clerk. This change to the Standing Order was effective immediately after the vote to give effect to the amendment. One of the reasons for the motion to be tabled is due to the issue of allegations that signatures of some of the Members of Parliament were forged. The change is also expected to cut the unnecessary cost to the public purse of running to the Supreme Court to determine whether the signatures of MPs are authentic or not. The mover of the motion, Mr Salwai, made particular mention of Constitutional Case No.3 of 2013 where the Chief Justice referred to the need to amend the Standings Orders of Parliament to minimize fraudulent practices. According to Port Vila’s Member of Parliament and Foreign Affairs Minister, Ralph Regenvanu, the change done yesterday to Standing Order 14 does not affect the existing motion of no confidence deposited by the Opposition during the ordinary session. Mr Regenvanu said the motion passed yesterday deals with how Parliament can be requested by the majority of members to sit in an extraordinary session, not how motions are lodged. 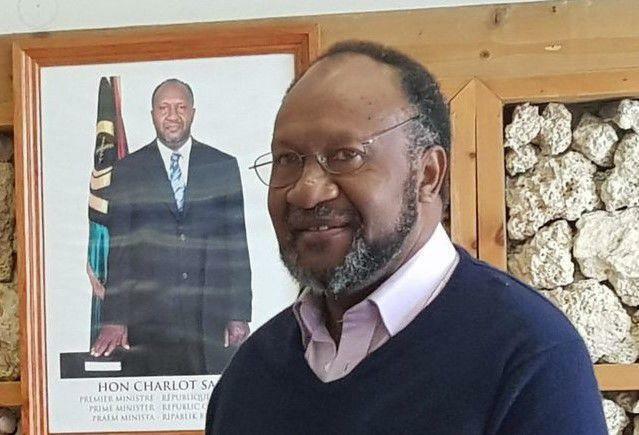 The Opposition-sponsored motion against Prime Minister Charlot Salwai was defeated by 36 votes against and 13 votes for, when parliament convened yesterday morning to debate the motion. This was the fifth motion against Prime Minister Salwai, since he was elected Prime Minister and still heading the government and leading the country. Some political commentators say the current Prime Minister will most likely continue as Prime Minister to the end of the term of Government and when the country returns to another parliamentary elections in 2020. Just before the motion was debated yesterday, Vanua’aku Party (VP), a party in the coalition government made it public that it does not support the motion. VP had to make this announcement following after allegations that the party was behind the fifth motion of no confidence. However, VP Secretary General Mr Hosea Nevu stated that the party was against the motion and any party member would be disciplined if they support that motion that was defeated yesterday. A GROUP of 40 foreigners have been granted citizenship by the PNG Immigration and Citizenship Authority. 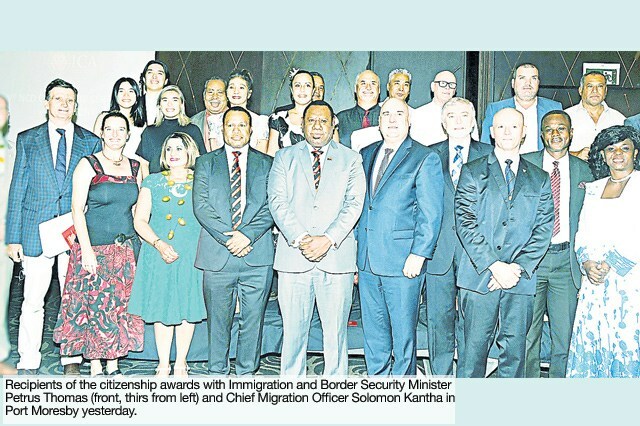 They were presented their citizenship certificates and passports in Port Moresby yesterday by Immigration and Border Security Minister Petrus Thomas. He said the increasing number of foreigners applying and being granted citizenship showed the confidence they has in the integrity and transparency of the process. It brings to 195 the number of foreigners awarded PNG citizenship in 2018. Many are West Papuans. Of the 40, 32 were granted dual citizenship and eight naturalised citizenship. The 32 people include 28 from Australia, two from New Zealand, one from United States and one from Fiji. They are either married to Papua New Guineans, invested and built their businesses in the country or have worked and lived in the country for many years. There are 17 former PNG citizens who have resumed their PNG citizenship, 11 long-term residents and four who became citizens by descent. The eight who have given up their other citizenship to remain in the country include a missionary couple from Ghana, two former Bangladeshis, and former citizens of Malaysia, South Korea, Turkey and the Philippines. Safak Deliismail, from Turkey, is the principal of Paradise High School in Port Moresby. 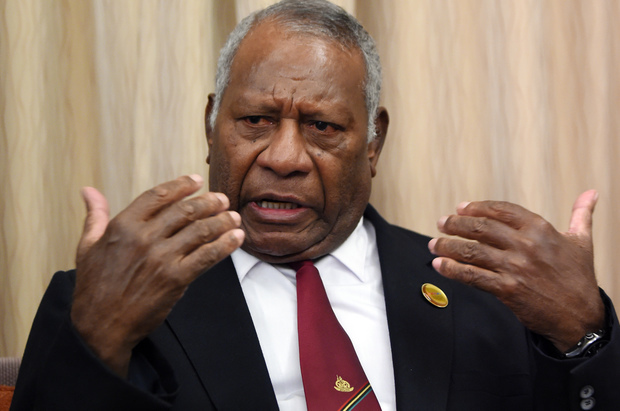 He thanked the PNG Government for granting him permanent citizenship. The Speaker of Parliament, MP Esmon Sai, confirmed to the Daily Post yesterday afternoon that a Motion of No Confidence was received by the Office of the Speaker last Friday afternoon. However, it is yet to be determined whether or not the motion is in order. “We are waiting for the State Law Office to advise us, if the motion received, is in order. “At this point I cannot confirm if it is order therefore cannot comment further,” Speaker of Parliament MP Esmon Sai, told Daily Post yesterday afternoon. According to reliable sources within parliament, if the motion turns out to be in order, it will be debated on Friday this week, two days after the closing date of the second ordinary session of parliament which is Wednesday 19th December 2018. This is the fifth motion of no confidence against current Prime Minister Charlot Salwai. He said this was needed because 1969’s so-called Act of Free Choice referendum, through which West Papua was incorporated into Indonesia, was fraudulent. Mr Parkop’s comment came amid escalating conflict between the West Papua Liberation Army and Indonesian security forces. The Liberation Army this month massacred at least 16 Indonesian road workers in the Highlands. Mr Parkop said the crisis would only be solved by a properly supervised and legally conducted referendum in accordance with international law. 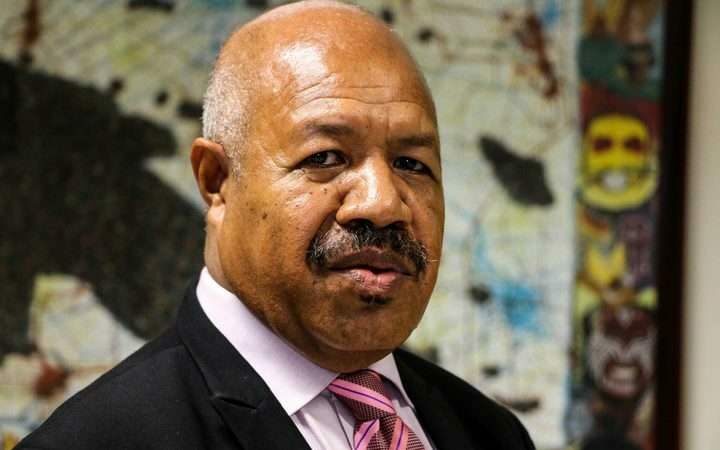 PNG’s government supports Indonesian sovereignty over West Papua. But the governor said conflict would continue unless West Papuans’ unquenchable desire for legitimate self-determination is met. Indonesia’s military will take over construction of a massive infrastructure project in Papua after a massacre of workers earlier this month. 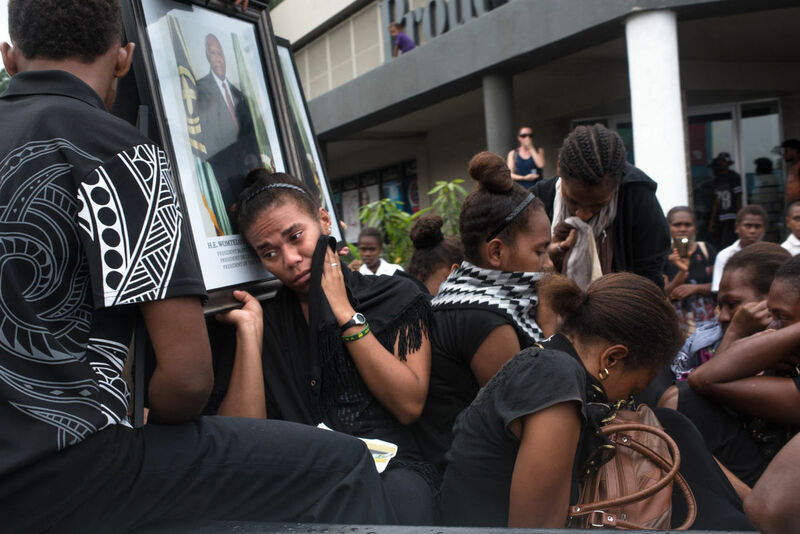 At least 16 employees from state-owned company Istaka Karya were killed by fighters from the West Papua Liberation Army, who accused them of being military spies. The workers were building a bridge in Nduga regency when they were rounded up and later executed. Antara News reported the military will resume work on the bridge, as well as on the 4,000-kilometre Trans-Papua Highway. Combat engineers will carry out the construction, with hundreds of extra security personnel deployed to the area. President Joko Widodo has pledged that infrastructure work in Papua will continue, despite the violence. A spokesman with Indonesia’s Kopassus special forces has denied troops have been deployed to Papua’s Highlands. 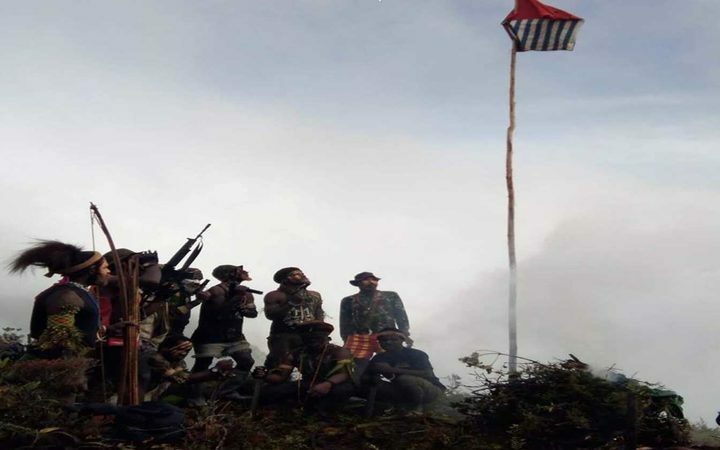 A major joint operation between Indonesian military and police in pursuit of the West Papua Liberation Army is underway in Papua’s rugged interior. The Liberation Army claimed responsibility for the murders of at least 16 construction workers and a soldier this month. With extra Indonesian troops deploying to the region, Tribun Medan reports that there’s been “clarification” after local media suggested President Joko Widodo had ordered a Kopassus unit to Papua. But Kopassus Chief of Information Lieutenant Colonel Denden Sumarlin said the special forces, who are ostensibly involved with counter-terrorism operations, were not involved in the Papua operation. 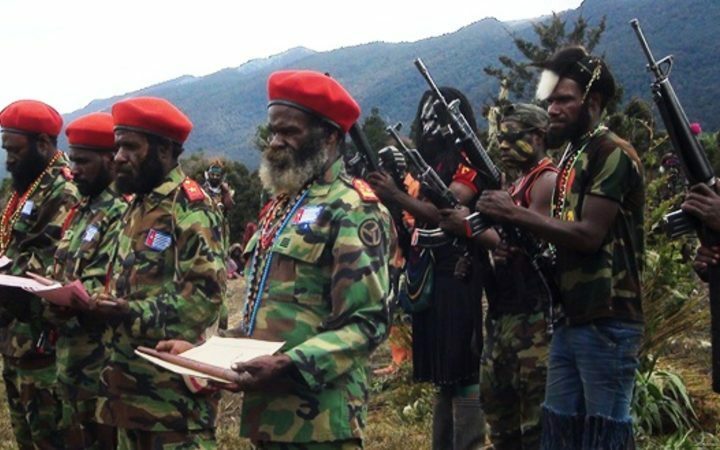 The West Papua Liberation Army is refusing to bow to Indonesia’s ultimatum and surrender. After the Army claimed responsibility for a massacre in Papua province earlier this month, Indonesian security forces deployed extra troops to pursue the pro-independence fighters. The search continues for four Indonesian road construction workers missing in Papua’s Highlands region after at least 16 workers were killed by the army. A spokesman for the Liberation Army, Sebby Sambom, presented a statement saying they would continue their war against the Indonesian state until independence is achieved. He said Indonesia has taken over the Papua region like a thief, and that it would not be right for the homeowner to surrender to thieves. On a video posted to youtube, Mr Sambom read an open letter to Indonesian President Joko Widodo demanding that he allow a referendum for Papuans to decide whether they want to be integrated with Indonesia. The Army has also called for unrestricted access to Papua for foreign journalists, as well as for the UN refugee agency and the international Red Cross to help take care of civilians caught up in the conflict. Indonesia’s Political, Legal and Security Minister Wiranto has told media that the government will not enter any discussions with the Army, who Jakarta describes as a criminal group. He said the Army had committed inhumane crimes, and that Indonesia’s government would take appropriate actions to ensure its citizens were protected. Earlier this week, Indonesia’s military said the Liberation Army had an ultimatum to immediately surrender or be finished.